Although I didn’t do alot of baking and cooking this summer, i DID manage to whip up this smores cake for a dinner with friends one night. I woke up the next morning wishing we hadn’t eaten it all. 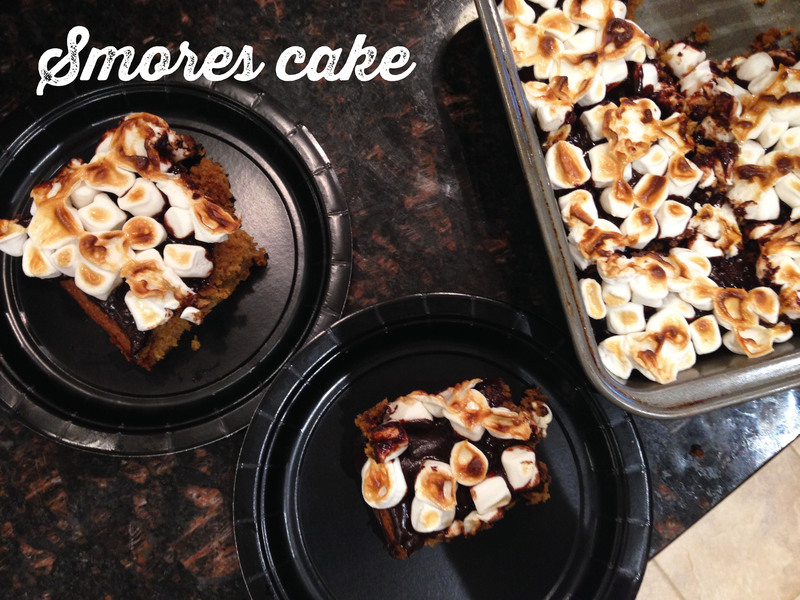 It was a fun take on the classic smores (which is one of my most favorite deserts ever). The cake recipe comes from the smores cupcake in vegan cupcakes take over the world. I poured the recipe into a 8×8 pan and baked it for 20 minutes. In a small sauce pan, bring the almond milk to a boil and then lower the heat to a simmer and add the chocolate and syrup. Mix with a rubber spatula for about 30 seconds. Turn heat off, continue stirring until the chocolate is fully melted and the icing is smooth. Ice the cake and then top with dandies marshmallows. Put back in the oven for about 3 minutes, but watch closely so your cake doesnt overcook and your marshmallows dont burn! I know what you are thinking….soup?! IN THE SUMMERTIME?! 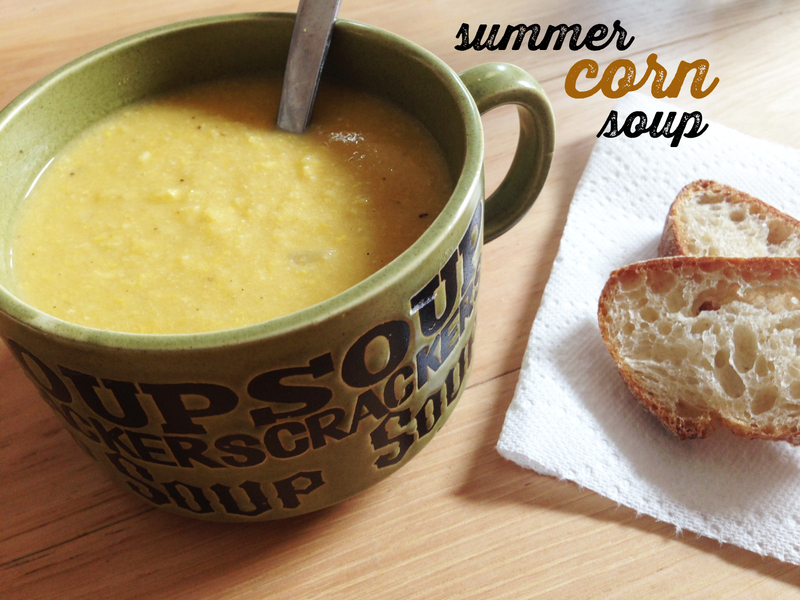 But rest assured, this soup is a great summertime supper. The sweetness of corn tastes just like the joys of summer. I was able to pick up the potatoes and corn at the weekly farmers market – so it was easily a spur of the moment dinner – And it didn’t take too much time to throw together, so its great for a weeknight meal. Don’t forget to serve it with some crusty bread! To a large saucepan over medium heat, add olive oil, onion and garlic and sauté for 3-4 minutes. Add potato, season with a little salt and pepper, and cover to steam for 4-5 minutes. Add the corn and stir. Add broth and almond milk, cover, and bring to a low boil. Reduce heat to low. Cook until the potatoes are soft and slide off of a knife when pierced – about 5-10 minutes. 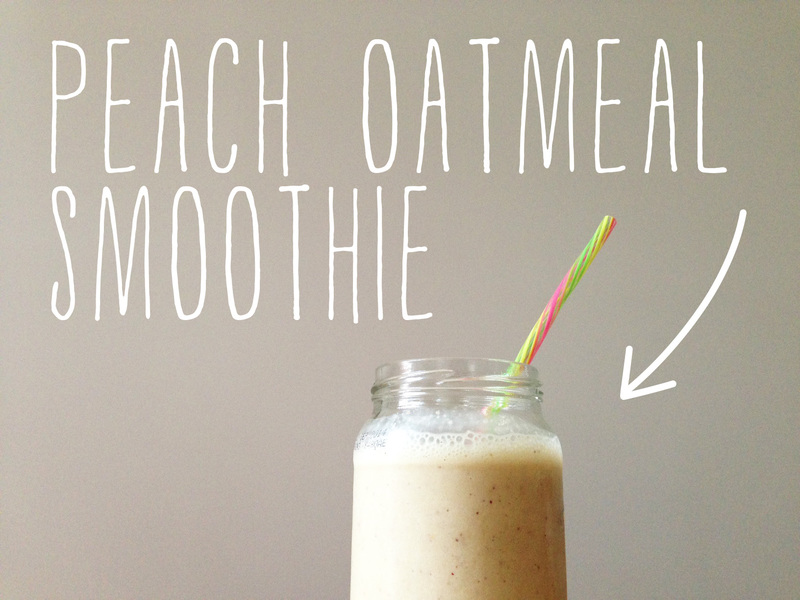 Add 3/4 of the soup to a blender and blend until creamy and smooth. You can also use an immersion blender for this as well. Add nutritonal yeast and mix in. Transfer soup back to the saucepan and bring back to a simmer. Taste and adjust seasonings as needed. Cook for at least 10 minutes to let thicken. The longer it simmers, the more flavorful it will be. Earlier this summer, while cleaning out our grandfather’s house – we found these quilts that our great grandmother had made. Quite a few of them actually. Alot of them were tattered and stained, but I couldn’t stand just throwing away something so old and something that so much hard work went into. So I took them and told the family that I would turn them into pillowcases, with the good parts, so that we can all have a piece of her quilts. I created a simple pillow case with a zipper at the bottom. I plan to mail these to family across the country, so this will make it easy to throw in an envelope and they can stuff a pillow into them when they get them. 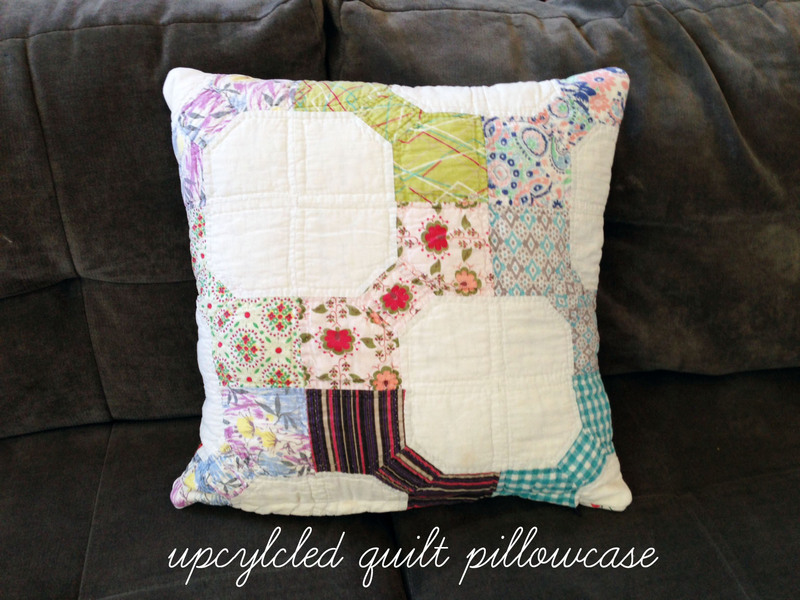 I was able to make four pillows from one quilt. I still have three more quilts to go! Whoah, summer has SLOWED down my blogging mojo. It’s been a whirlwind of a summer – not much cooking, baking or crafting has been going on in our household. But my garden is producing vegetables faster than I can use them, and it was about time I put some of them to use. I planted “pickling” cucumbers, so I did just that. 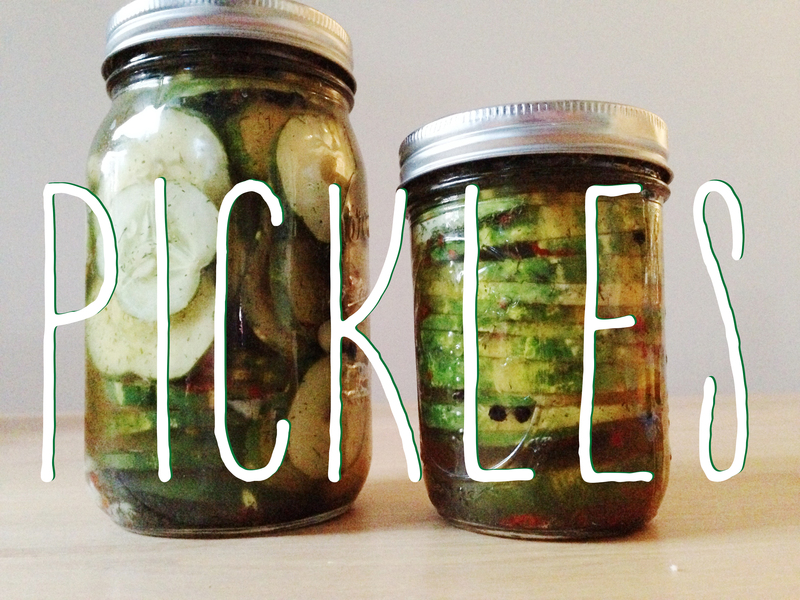 I pickled them. These are basically a small, fat cucumber, and I had three of them, on the bigger side. Wash and slice the cucumbers. slice into rounds. In a medium saucepan, bring vinegar, water and salt to a simmer. Remove from heat. Divide the spices between your jars. Add the sliced cucumbers and pack tightly. You don’t want to pack hard enough to bruise the cucumbers, but make sure there are quite a bit in there. Pour warm brine into each jar, leaving about 1/2-inch headspace. Place lids on the jars and let cool to room temperature before storing in the fridge. Allow to rest for 2 days before enjoying. Pickles will last up to two weeks.